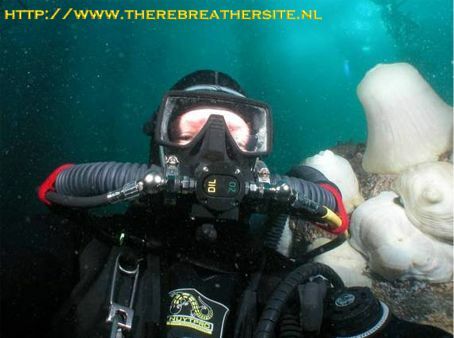 Op deze pagina wordt een uitleg gegeven over de werking van de KISS rebreather. 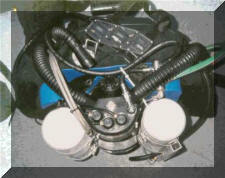 Het concept voor dit type rebreather is uitgevonden door Gordon Smith. Voor de uitwerking van dit artikel en voor de foto's gaat mijn dank uit naar: Gordon Smith, Dave Sutton, Bill Elliot, Steve Millard, Michael Kuwilsky and Jeremy Quinn. 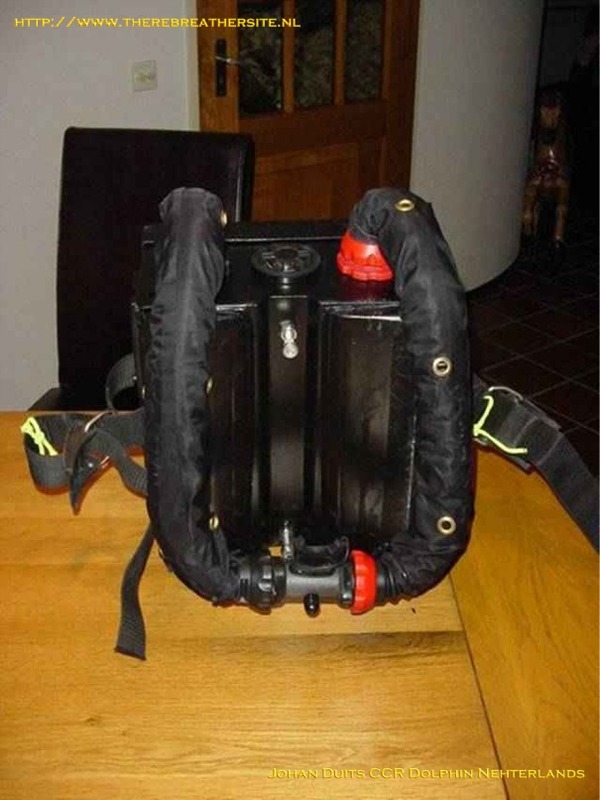 On this page there is information on the functioning of the KISS style rebreather. 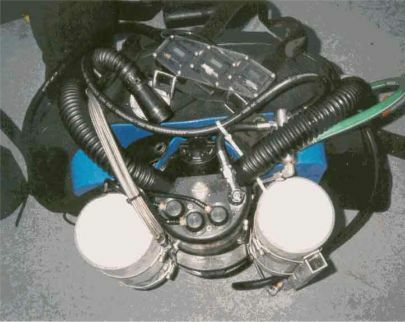 The concept on this type of rebreather was invented by Gordon Smith. I want to thank Gordon Smith, Dave Sutton, Bill Elliot, Steve Millard, Michael Kuwilsky and Jeremy Quinn for there corporation on this article (photo's and finetuning of text). Wat is het KISS principe? Het staat voor Keep It Simpel Stupid. Het is een principe wat door de Canadees Gordon Smith is bedacht. Hij heeft een rebreather ontwikkeld waarbij het accent op functionaliteit en eenvoud ligt. 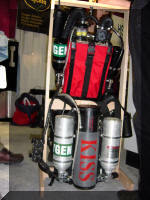 De KISS rebreather is een gesloten rebreather (CCR). 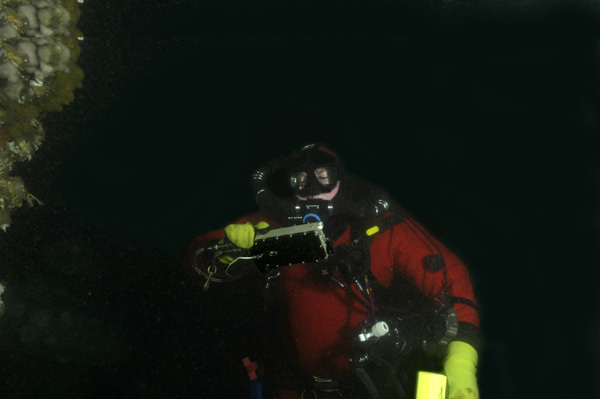 De werking van het toestel berust op dezelfde principes als de geregelde gesloten rebreather, echter is ontdaan van alle elektronica en elektrische componenten. 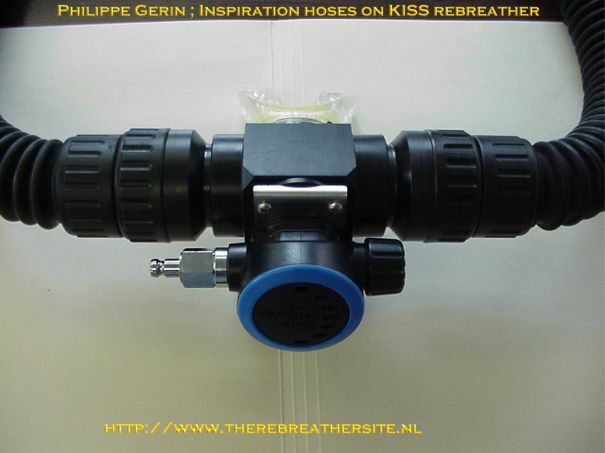 Allereerst dient het principe van de Inspiration rebreather worden begrepen voor de verdere uitleg van de KISS rebreather volgt. Voor de Nederlandse lezers verwijs ik hiervoor naar deze pagina, en naar deze pagina What is the KISS principle? First it means "Keep it Simpel Stupid". 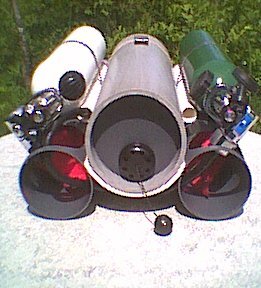 The principle was originally thought out by the Canadian Gordon Smith. 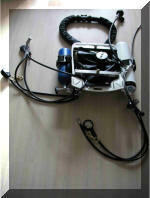 He designed a rebreather with the accent on functionality and simplicity. 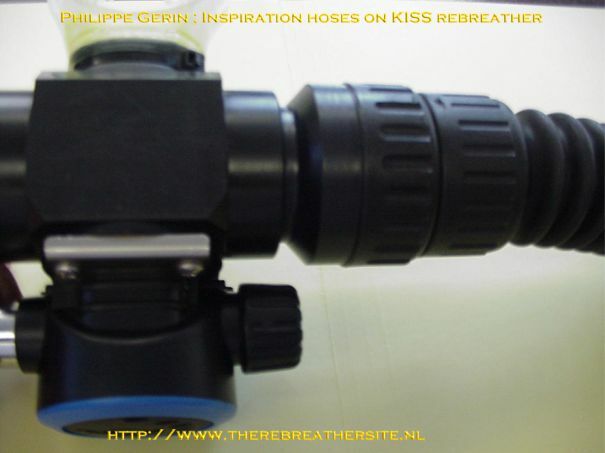 The KISS rebreather is a closed circuit rebreather. 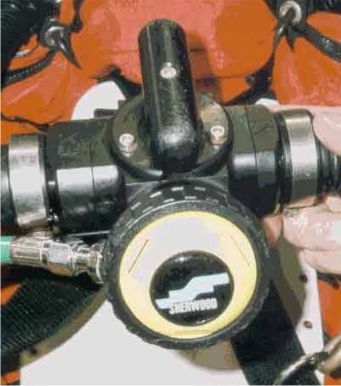 The system is based on the same principle as the electronic controlled oxygen addition closed circuit rebreather, however without the controller electronics. 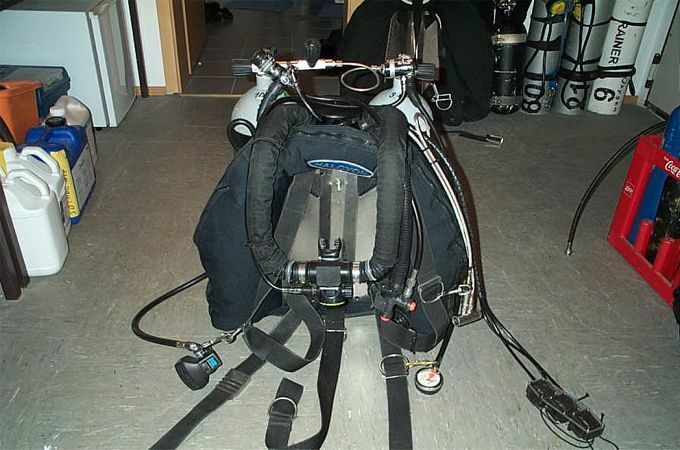 Before going into details of the KISS rebreather, it is recommended that one should understand the principle of the Inspiration rebreather. Please read the pages of Ambient Pressure Diving carefully until you understand the functionality of an electronic controlled rebreather. 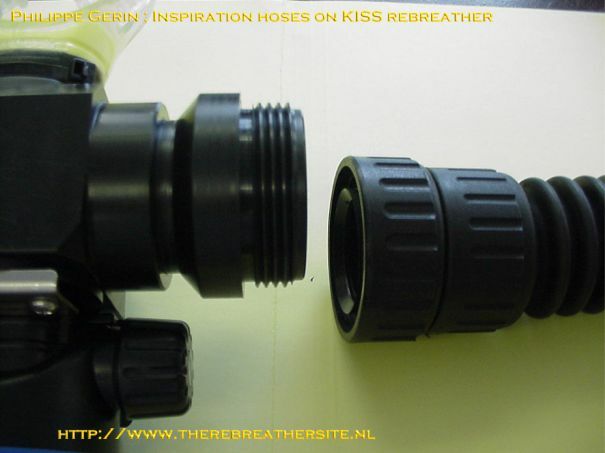 How does the KISS rebreather operate? Most important is that the necessary oxygen is not added by means of electronics but through the use of a modified first stage (fig 1). 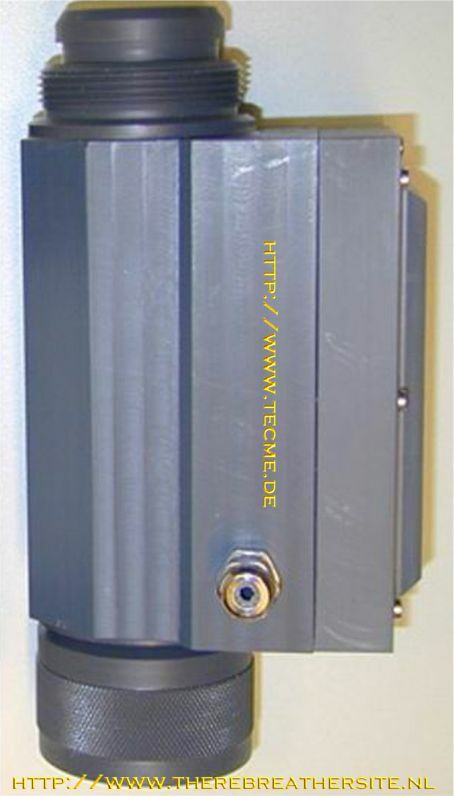 This first stage is modified in such a way that the IP is set at 8 bar. 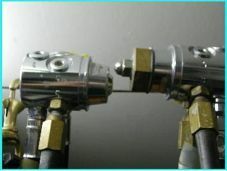 Now using a metering valve or restriction nozzle it is possible to create a flow of 0,3 - 1,5 liter oxygen per minute to the loop. 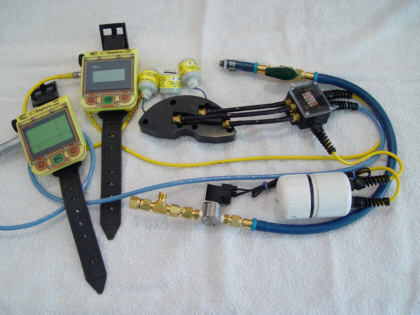 The flow is adaptable to the personal metabolic oxygen consumption of the diver. The oxygen consumption stays consistent at equal energy demands, also on increasing depth. Only when the diver works harder more oxygen is required. 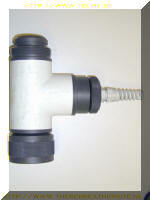 The regulator is modified in such a way that increasing depth does not affect the flow rate. 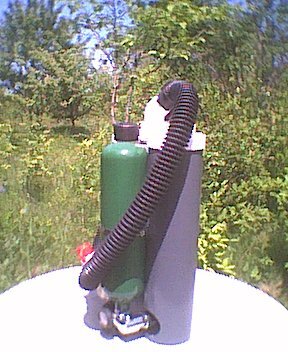 The regulator is mounted on the oxygen bottle and a hose is directly connected to the scrubber lid and feeds directly into the loop. 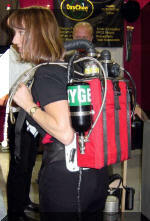 When the diver needs more oxygen he/she can add extra oxygen to the loop by pressing the manual bypass button. Op de inademlong is een ADV geplaatst. (automatic diluent valve). Dit is in feite een veredelde tweede trap die als de druk in de inademlong te laag is automatisch diluent toevoegd. De duiker zal dan ook tijdens de afdaling de ADV in werking horen treden. Lees overigens het artikel van Steve Millard eens hoe de partiele druk zich vrij goed handhaaft tijdens een rustige afdaling. On the inhalation counterlung an ADV (automatic diluent valve) has been placed. 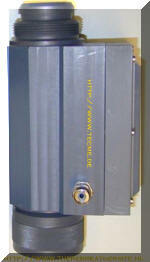 In fact it is an improved second stage regulator. 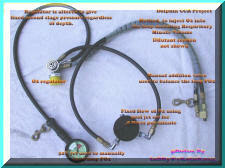 This regulator adds diluent to the loop when the pressure is too low in the inhalation counterlung. 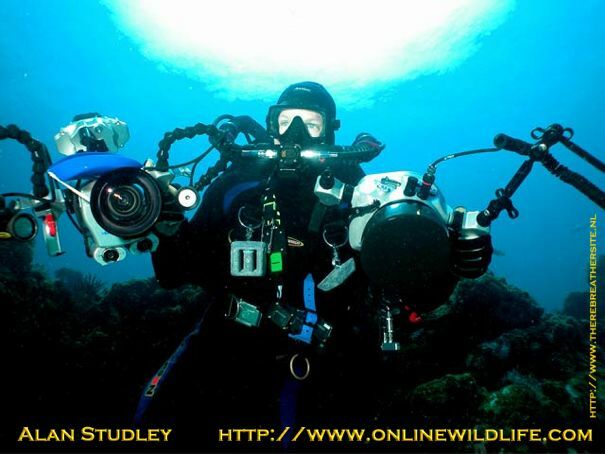 When the diver descends he will hear the ADV working and he will feel that gas is being added to the loop. If you are worried about the variation in the setpoint on descending read this article of Steve Millard. You will find that the partial pressure of oxygen is rather steady on a slow descent. 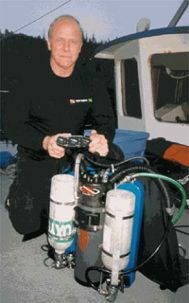 In tegenstelling tot geregelde systemen is in de KISS rebreather geen computer aanwezig. De duiker doseert slechts het tekort aan zuurstof, of verdunt met diluent. Voor de bewaking van de partiele zuurstof druk wordt gebruik gemaakt van drie volledig gescheiden en onafhankelijk werkende partiele zuurstof displays. De werking van deze displays is uitzonderlijk simpel. Een cel meet in de loop en geeft een spanning af aan een voltmeter die een eigen batterij heeft voor de digitale weergave van de gemeten partiele druk. De callibratie vindt plaats door 100% zuurstof in de loop te injecteren. Met een potmeter wordt de uitlezing van de displays ingesteld. 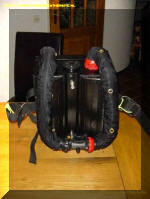 Een alarm is in de KISS rebreather niet voorhanden. 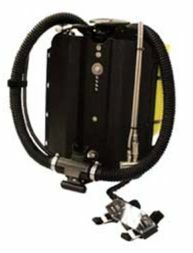 Unlike the Inspiration or other electronic controlled rebreathers there is NO computer present in the KISS rebreather. 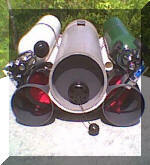 The diver only adds oxygen when the setpoints are low, or blends with dilluent. This occurs in case of hard work or ascending. 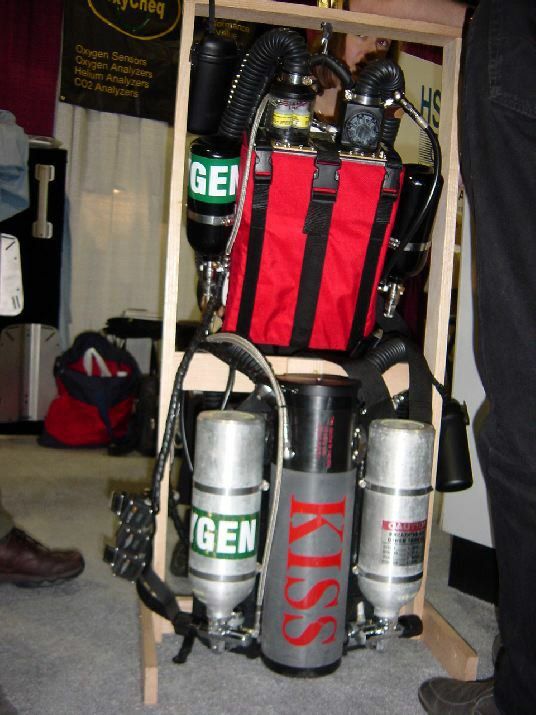 To guard the setpoints the KISS system is equipped with three totally independent oxygen partial pressure displays. These displays work extremely simple. An oxygen cell is fitted in the loop and induces a small voltage which signal is displayed on a LCD with a separate battery. This is done three times. This way there are three independent measurements. In order to calibrate the cells, pure oxygen is injected into the loop. With a potentiometer the display is calibrated. 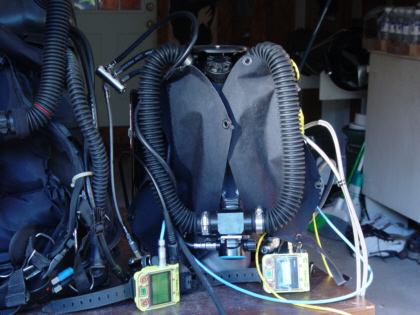 In the KISS rebreather there is no alarm system available. 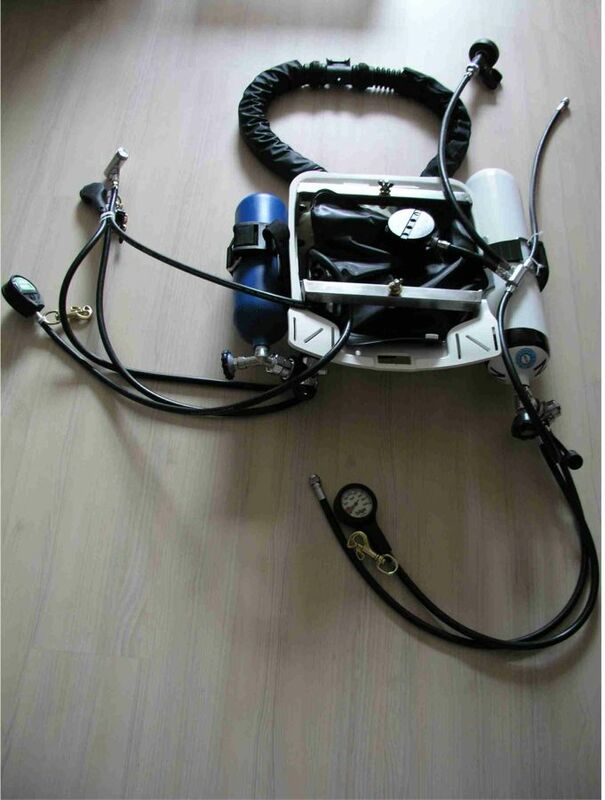 Het principe van de KISS rebreather wordt door een vrij grote groep Rebreather duikers toegepast om bestaande systemen (veelal SCR) om te bouwen naar CCR. Het is echter van bijzonder groot belang terdege te studeren hoe deze modificaties dienen te worden uitgevoerd. 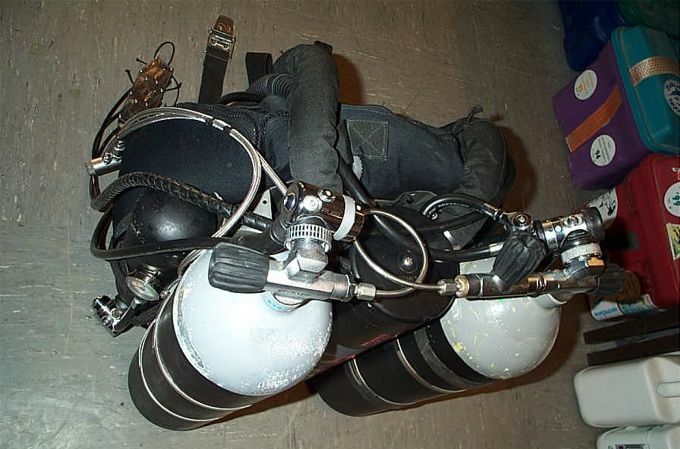 Het gebruik van dit type rebreather vergt een speciale opleiding bij een erkende instructeur. 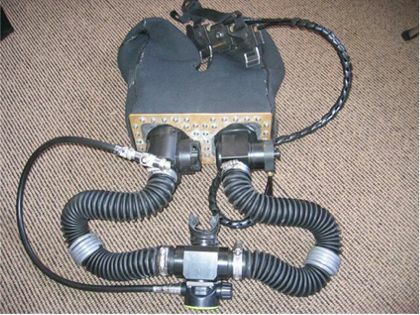 The principle of the KISS rebreather is used by a rather large group of rebreather divers in order to rebuilt there (mostly SCR) rebreather to a closed circuit system. It is of great importance however to study the principles intensively before you modify your system. 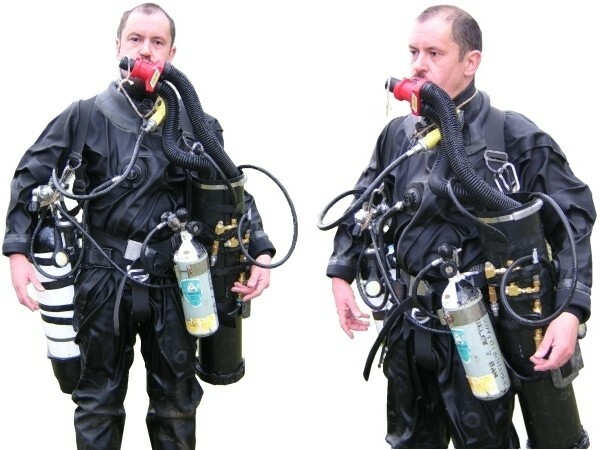 The use of this type of rebreather demands a specialised training from a certified instructor! 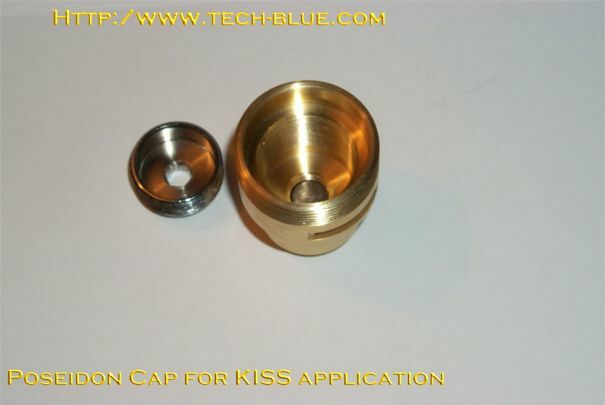 Here are extra pictures sent by Gordon Smith on the new developed mouthpiece !! 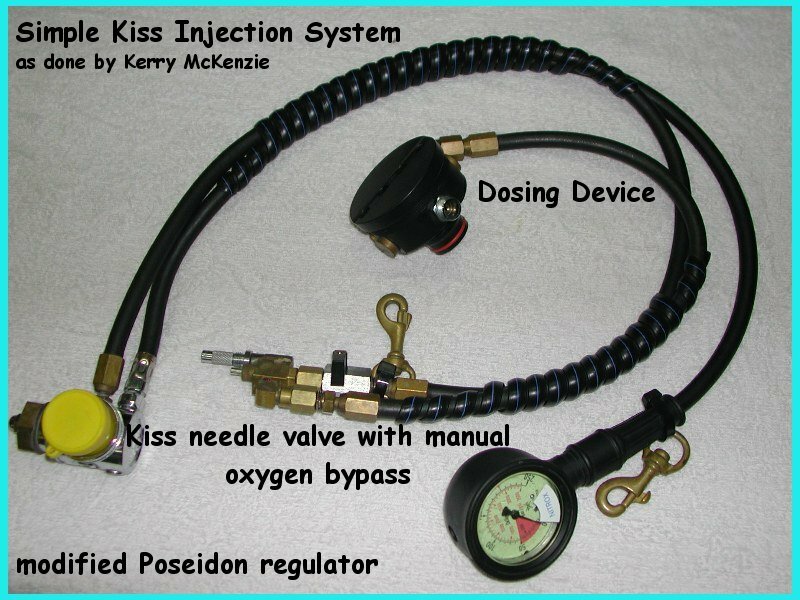 Kiss ans Baby Kiss rebreathers,sent by Stephan New Baby-Kiss sent by Stephan Rainer Degner sent me this Kiss configuration. Rainer Degner sent me this Kiss configuration. 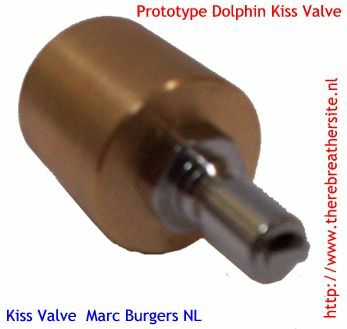 Prototype Kiss Valve made by Marc Burgers Netherlands. Definitive version in stainless steel. 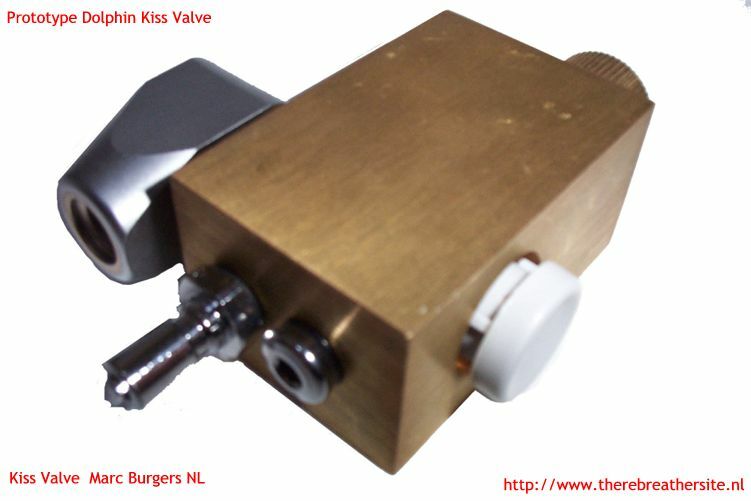 Prototype Kiss Valve made by Marc Burgers Netherlands. Definitive version in stainless steel. 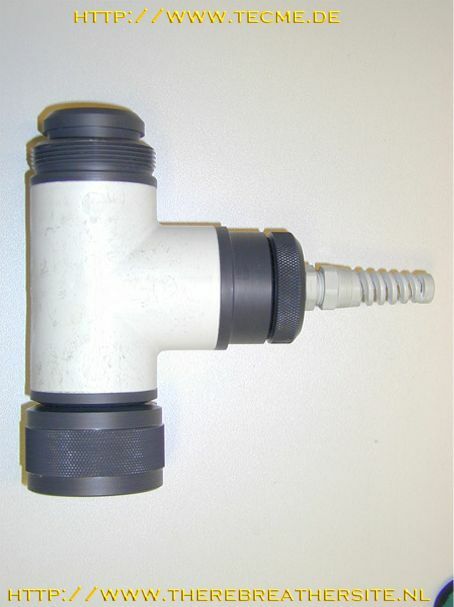 Prototype Kiss Valve made by Marc Burgers Netherlands. Definitive version in stainless steel. 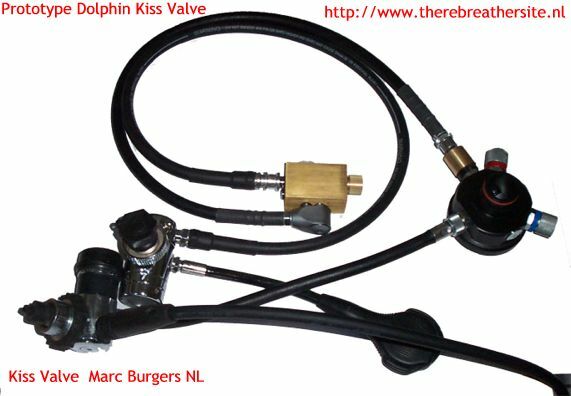 Prototype Kiss Valve made by Marc Burgers Netherlands. Definitive version in stainless steel. 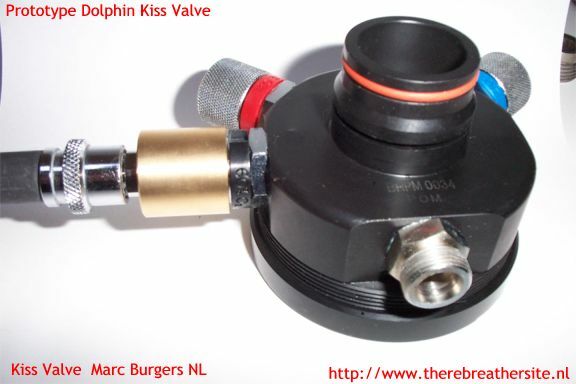 Prototype Kiss Valve made by Marc Burgers Netherlands. Definitive version in stainless steel. 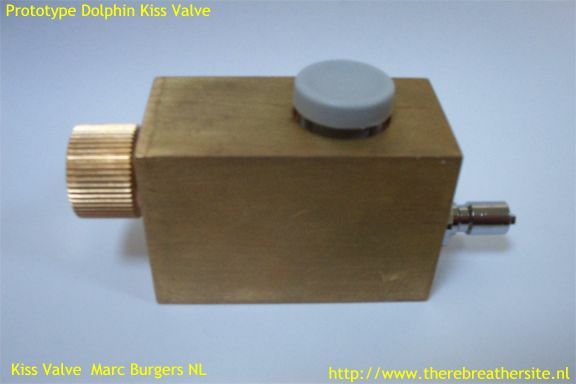 Prototype Kiss Valve made by Marc Burgers Netherlands. Definitive version in stainless steel. 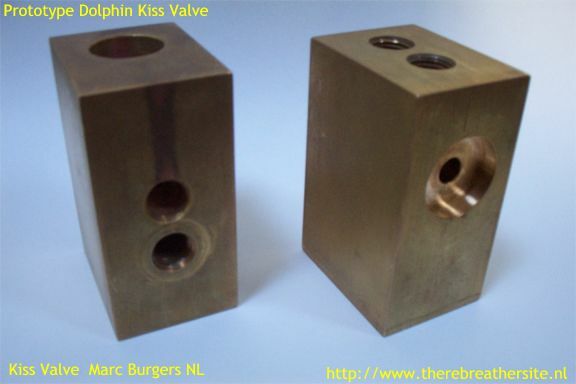 Prototype Kiss Valve made by Marc Burgers Netherlands. Definitive version in stainless steel. Recently Dave Sutton wrote a nice explanation on the Kiss-style working principle. He was kind enough to allow me to publish it here. I am sure it will add something to a better understanding. Thanks Dave ! 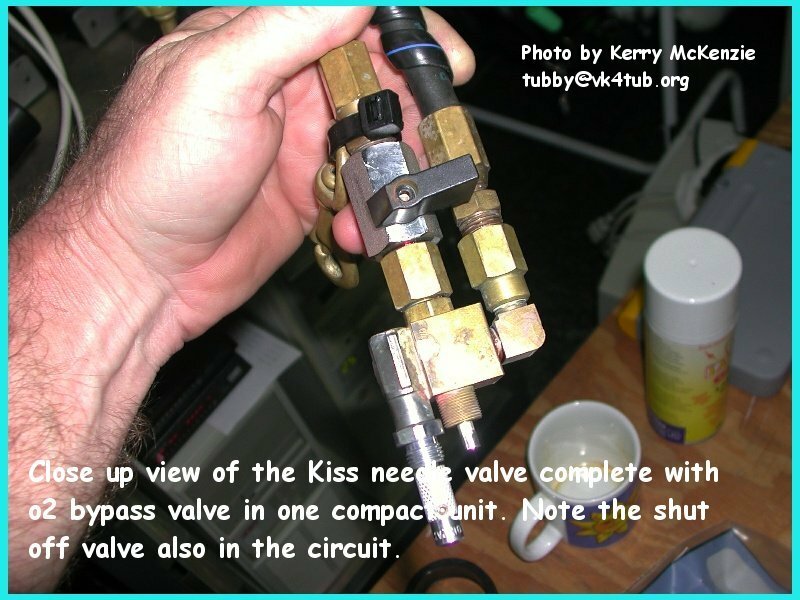 "It's not that complex, so here goes: "
The term KISS as used for rebreathers was coined by Gordon Smith, who first began using this system for diving rebreathers in his KISS (keep it simple, stupid) rebreather. 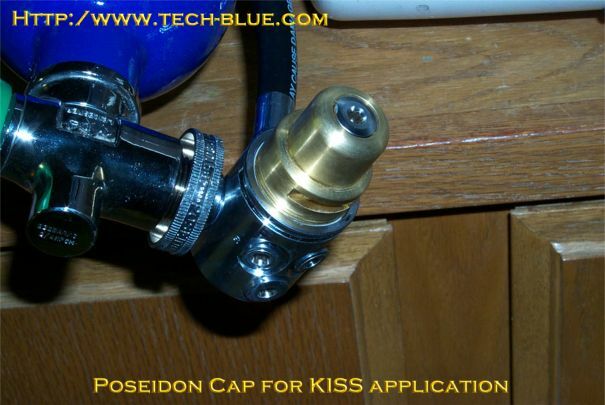 The term KISS is, out of courtesy, reserved for those rebreathers and components made by him. If you copy it, you are diving "Kiss Style". The use of the term isn't law, it's courtesy to Gordon who deserves all of the credit for introducing this method of operation into widespread use. The system relies on the fact that for each person there exists a basic 02 metabolic need, which only varies slightly over the course of any time period. The numbers seem to range between 0.8 and 0.9 litres of 02 per minute, when that volume is measured at 1 Atm (surface pressure). Actually, we don't need any "volume" of 02 at all, we need x "molecules" of 02 per minute, and at the surface that amount is contained ina volume of about 0.8 litres. At 33 feet (2 ATMA0, the volume of 02 needed would be half of that, but that volume would be twice as dense, thus the number of molecules is the same as the 0.8 litres at the surface. You can continue this down to any depth. What is done to dive "KISS System" is to produce a very small constant *mass* (not volume) freeflow of 02 into the loop that is (and this is VERY important), slightly LESS than that needed by the diver. You want the PP02 to be constantly dropping down slowly, and NEVER want it to be raised. Higher PP02 will; kill you faster (expressed in time) than low PP02, as you dive a lot closer to the threshold of the high limit(1.6) than at the low limit (0.2) when diving reasonable setpoints (1.2). Plus, it's a lot easier to manually add a little squirt of 02 every 20 minutes than it is to try to lower the PP02 by adding diluent, and then venting the loop. To obtain a constant MASS of 02, we first select a correct orifice V/S inlet pressure to provide a range of flow rates that is about correct for the job. 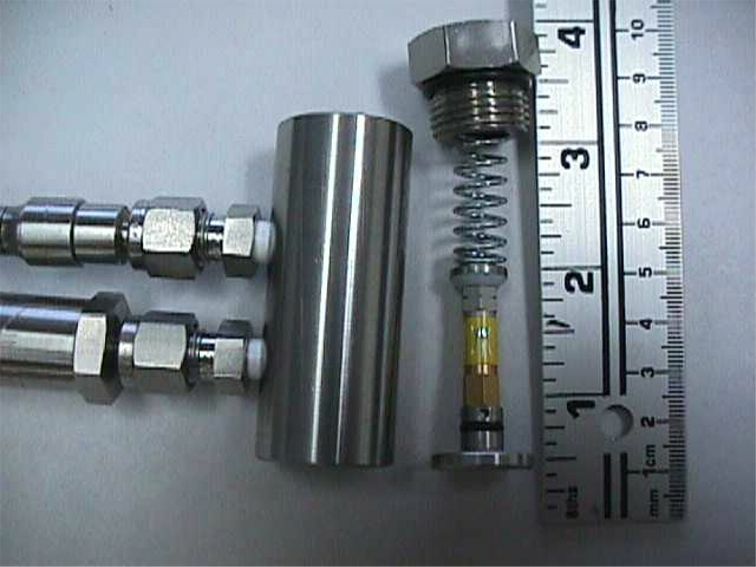 Using supply pressures between 120 and 135 PSI, an orifice of 0.003 inches will flow between about 0.7 and 0.9 LPM. 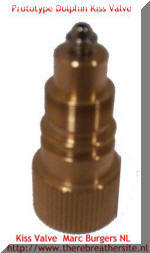 You can adjust the supply pressure to set the flow as desired. This is half of the system. Once that's been done, and tested by the diver (at home on the couch works fine! ), the other part of the job is to make that a constant MASS, not volume, at deeper depths. if the supply regulator were able to sense the external pressure, it would be producing it's original output pressure *plus the pressure of the water column* into the orifice, and thus the flow MASS would be increasing as the diver descends. 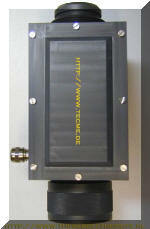 To preclude this, the first stage is modified to block the port where it senses the outside water pressure. Now the regulator becomes an absolute pressure regulator, and doesn't sense nor regulate in respect to the outside water pressure. 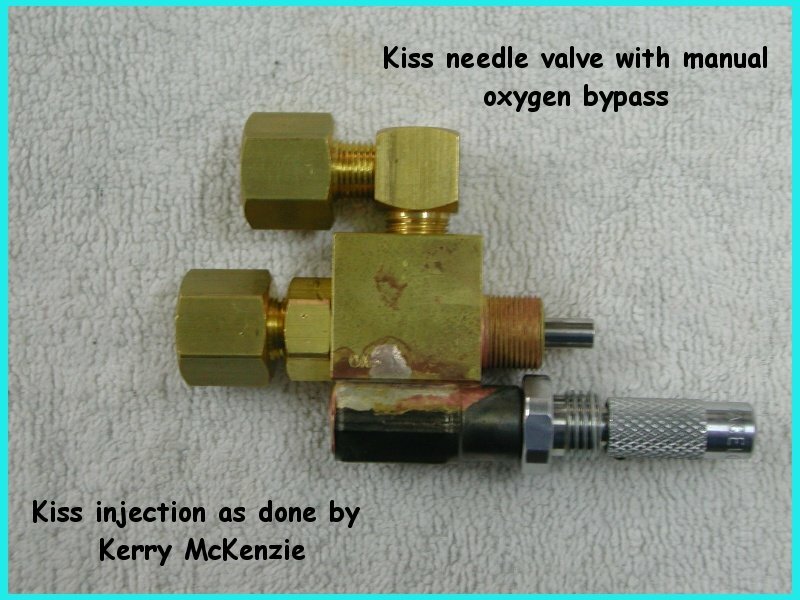 A properly designed KISS-system will have a restricting orifice, a modified regulator, and some way to manually add 02 periodically tomake up the difference between the 02 flow and the needed 02 mass. and descend to the bottom using a 21% diluent (usually). Once on the bottom I top-off the loop to 1.2 PP02 with a short (1-2 second) manual 02 add, and then begin watching the PP02. On a dive of usual physical workload (cruising around a wreck), I don't add 02 then for about 20 minutes, as I wait until the PP02 drops to somewhere between 1.0 and 1.1. I then drive the PP02 back to someplace between 1.2 and 1.3 and then repeat. Again, about 20 minutes later the PP02 is back down to 1.0 to 1.1. You end up looking at your PP02 a lot more often than you do anything about it, and the extra work to top off the PP02 is insignificant. 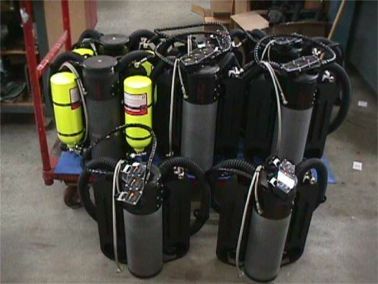 I've dived over 50 types of rebreathers, have at least 20 in the shop here, and that includes (2) Mark-15's with all of the latest bells and whistles. Even after diving all of the fancy electronic controlled CCR's, I still have to say that the KISS system of operation is simpler, more intuitive, and more reliable than any microprocessor driven CCR that I've ever dived. And why not? We've substituted the best computer ever, the human brain, for an unthinking software routine, and then unloaded a god portion of the work onto a simple orifice. As long as the main computer (your brain) is *correctly programmed* the system is excellent. Hope that's succinct enough for your contemplation! depth is not a problem if only done occasionally. Photo thanks to Alan Studley. Dave Thompson, the original designer of the Buddy Inspiration ECCR, put it very well. He said; "The bad thing about manual CCR's is you "need" to drive them, and to a degree that's task loading...The good thing is you KNOW that if you don't, you will die. It focuses the mind. The good thing about electronic CCR's is you don't need to do anything because they drive themselves. The bad thing about electronic CCR's is they MIGHT go wrong, and you MIGHT not notice it because you don't need to do anything right!!!!" I designed and made these adapters a few months ago and used them in various conditions since. 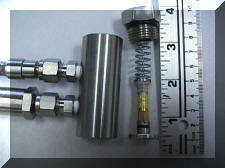 They are to be used with the Inspiration fittings (part # RB12 assembly "hose swivel"). They make breaking the loop apart very easy. Check out Billy Hammond Conversion site! 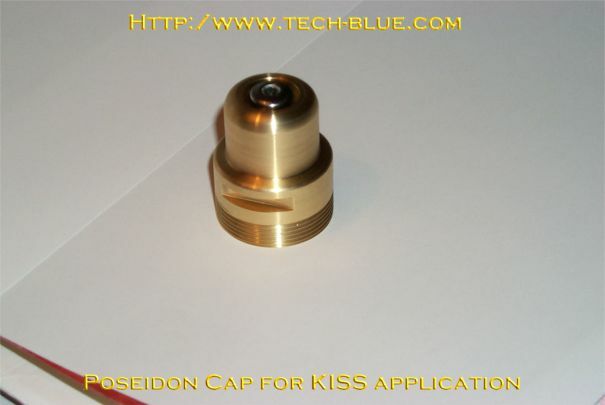 Have you been thinking about rebuilding your Kiss system to be ECCR? 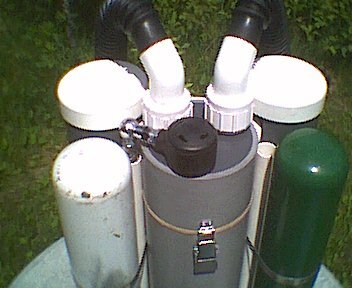 And.. would you have a Buhlmann based full trimix computer build in the system? Bruce already did! 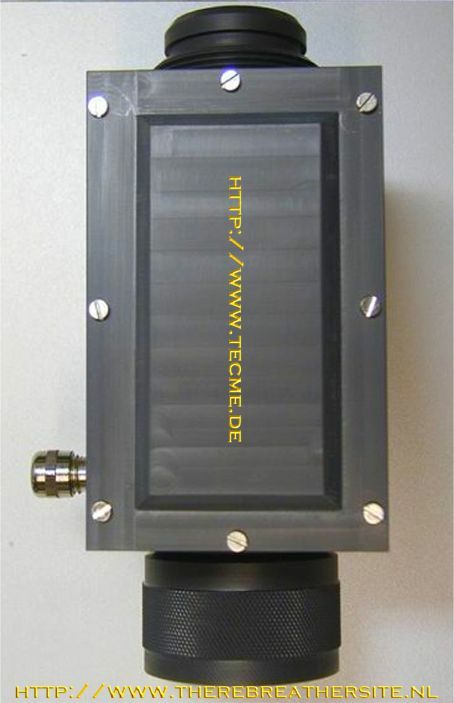 Check this out..
3 Cell O2 sensor box. Has space for 3 R22D cells (or similar) and 9V block battery. 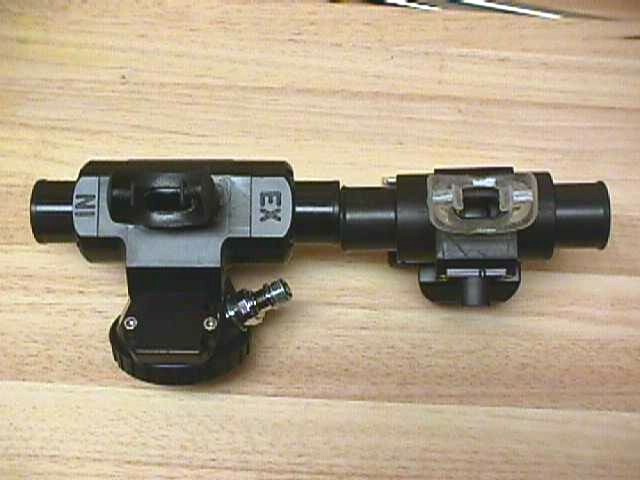 To be fitted to the Dolphin like the OXY2. 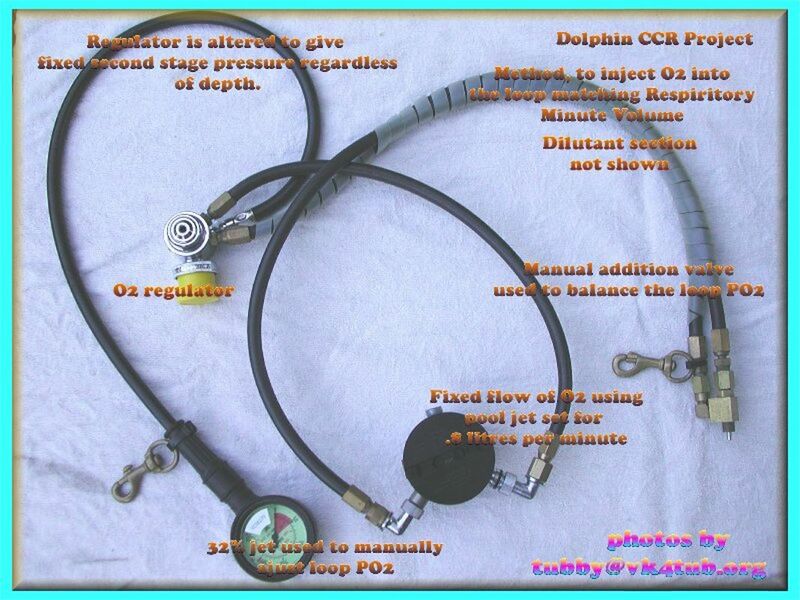 Ideal for monitoring ppO2 when diving KISS style or CCR without placing 2 or three cells in the breathing bag. 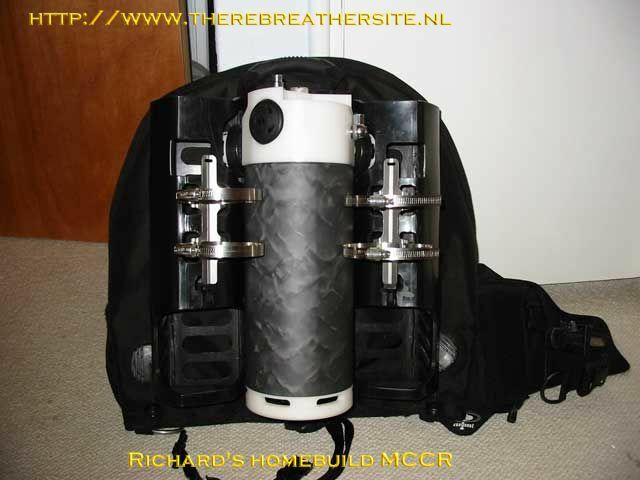 Did you build a Kiss Style rebreather and want to share pictures of your rig? Please sent pictures!